So I haven't done a great job at posting each day with the things that kept us busy...sorry! It is amazing how tired I have been each night though after entertaining 3 little girls who are, once again, stuck at home! We are offically now at about 17-18 inches of snow with more expected over the next 6 days! It is crazy! This is very, very unusual for Seattle but it has been very fun! It is absolutely beautiful right now and, even though we are stuck at home, it has been a nice change from our usual rainy winter! So...here are some of the things we have done over the past 3 days! **We made Christmas cupcakes (shaped like stars) and then decorated them. They were actually pretty yummy! **We actually got out of the house for a couple of hours on Saturday and braved the snowy, icy roads. We realized that if we didn't get out, the girls were not going to have a chance to see Santa so we went with some friends to "Santa's Den". We didn't get any pictures there because you aren't allowed to use your own camera but here are some pictures from our trip there. We had to hurry home so we could get there in time for the next snow storm to move through! **We opened 1 gift...from Mimi & Papa! We decided to let the girls open 1 of their gifts so that it would give them something new to do! All 3 girls got huge tubs of Crayola products so we have done lots and lots of crafts! **Rylie did our makeup! As you can imagine...we were all beautiful! The pictures didn't come out very well but...you get the picture! **And finally...we got more snow! Here are a few pictures to show you where our snow level is now! The first picture is of our mailbox...if the snow gets any higher someone's mail is going to get wet! The last picture is of a fire hydrant right in front of our house. You can barely see it (it is yellow) so look closely! - We watched movies, played games and misc. things around the house. Mommy spent some time overhauling the playroom! We got rid of some old stuff, cleaned up other stuff and organized everything! - After a lunch of grilled cheese, Taitlyn went down for a nap and daddy headed outside with the big girls! Our snowman had collected some new snow overnight and he now has a big afro or helmet as the girls called it! It was really funny! They also went to sled some more. The snow was so deep that the girls had to trail behind daddy and walk in his footsteps! If you look closely you can see the snowman's new "do"! - The rest of the day was pretty restful. The girls watched another Christmas movie, rode their scooters in the house, did puzzles, played games, etc. We made pizzas together for dinner and then watched home videos from the past 2 days. It was another great day! - We all went outside to play in the snow about mid-morning. We spent about an 1 1/2 hours just in front of our house playing and making a huge snowman that is taller than Tim! Even though he is huge, we probably didn't use 1/4 of the snow that was in our front yard. - After the snowman, Taitlyn wanted to go in so she and I headed inside for lunch and a nap while daddy took the big girls down the street to sled. This was the first time Madison actually wanted to do it and she loved it! After sledding...very wet and very cold! - After lunch we watched Miracle on 34th Street together and played some games. - More time to play in the snow! This time they conquered the backyard! The backyard before the girls got there! Madison was going to try to "bury" Rylie in the snow but the snowflakes kept falling in Rylie's face (as you can see in the picture below) so she decided very quickly that it wasn't much fun! - Before dinner the girls and I made Christmas wreath treats...lots of fun and lots of mess! Our wreaths had plenty of "berries"! Don't worry, Taitlyn really did enjoy it...she just didn't want her picture taken! Then dinner, bath, and off to bed to get lots of rest for another full day in the snow tomorrow! Madison playing outside when the snow first started to fall. Madison's favorite thing to do is not sledding, not making snow angels or even snow men. She just LOVES to eat the snow! 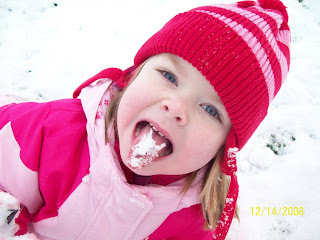 Almost every picture we have of her is her eating snow! Since Madison loves eating it so much we decided to make snow ice cream...something that both Tim and I grew up making (on the rare occasion it snowed!)! It was so yummy! Taitlyn waiting for her snow ice cream! The girls playing one last time in the snow before bed. If you look closely, you can tell that they are in their jammies and winter coats! This is what it looked like Sunday morning when we got up! The girls getting ready to play. I made them take a picture before they stompped through all the snow! This was the first year our girls had "official" snow attire! Madison loved the fact that she could even sit in the snow without getting cold or wet! Our bush/tree right outside our front door. It was beautiful in the snow! Daddy helped the girls make a snow couch in the front yard. It was so cool and, as a friend of mine called it, very "white trash"! The girls loved it though! This is Madison and a good friend of hers who came over for a little while to play.